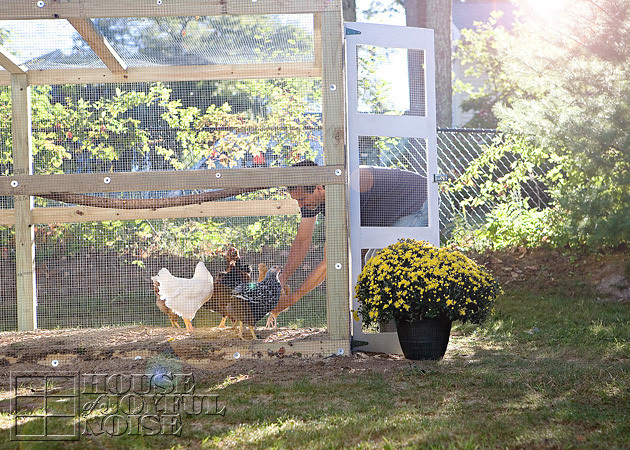 It’s the Chicken Coop Reveal! 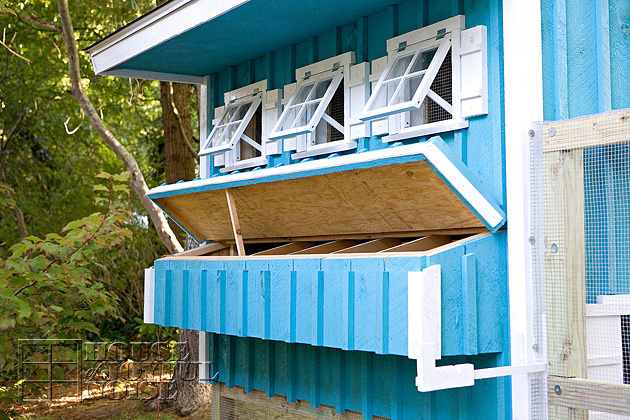 Finally, we are ready to reveal to you the chicken coop that has been in the works for 2 months! We know many of you have been waiting to see it, and we have to tell you, we’re pretty darn excited to show it to you! PLEASE NOTE: There are many photos in this post, so please give them time to load. Then at the end there is a link to even more photos that I thought some would like to see, such as early stages of the coop being built (for those who may have missed it on Facebook), the inside of the coop, and and a closer look at some of it’s other cool features. So, as lots of people know, I have wanted to get some chickens for so very long! Michael has always said I could, but the time was just not right for a long time, while we got the inside of our home finished, our property set up as we wanted it, and ready, etc. It’s been a long time coming, but we’ve been living the little dream now, of having chickens, since we got 1 day old chicks about a week into July of this year. Chicken-keeping has been as fun and exciting as we ever thought it would be! 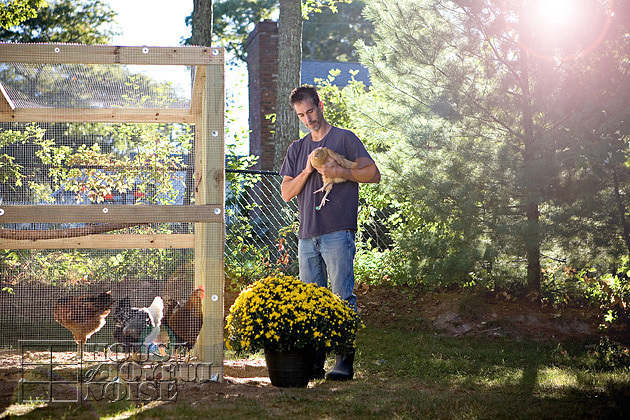 All I ever wanted or dreamed of for my someday-chickens, was a small and very simple coop. But, Michael really goes all out when he gets brain-storming. He’s very creative, ingenious, and handy in craftmanship, and well, he got sketching, as always. The detailed features also grew as he built it, and it has been pretty amazing and exciting to see it all come to life, built from the ground up, from what stared as little possible plans on paper. Many of you who follow us on Facebook were able to see some progress photos of the coop that we shared, as we began to build. The photo above was as far as we took you before we decided that anymore might ruin the surprise of the final reveal. Especially when we were getting ready to stain it with color! We figured many would be most curious about what color we’d choose. I considered many colors, but there was really one that was always just how I imagined my someday-chick-coop in my head, and while I looked at other colors, I just never could let go of that original image in my head go. We hope you love it as we do, but it’s really o.k. if you don’t. (We still will.). 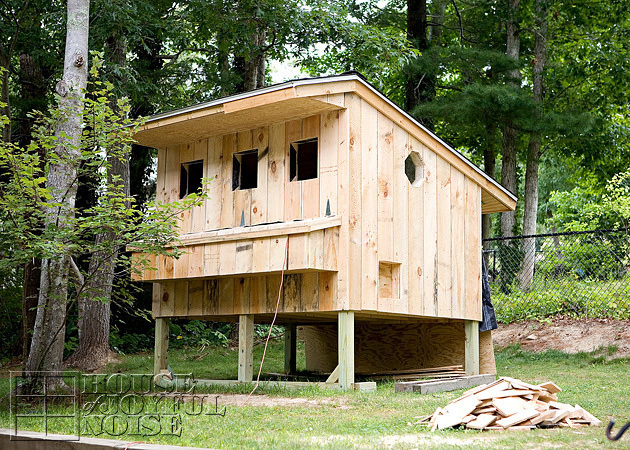 And now for our 97% finished coop . . . . . .
As I mentioned, the color is a stain. But I suspect it will fade in the sun over time, and I’ll love it even more. Just as the wood of the run will weather, to my liking. I couldn’t love the windows any more! They actually each have 2 built-in prop sticks for 2 different options of how much to open the windows. And all window openings are protected with hardware cloth, to keep chickens in and predators out. The nesting boxes are perfect. It won’t be long before we’ll be collecting eggs from them daily! Whenever we step near the coop door here, all of the flock come running over to us. The love is so mutual! Or, maybe they think we might have treats. But we like to think it’s about love. The run was built solid and well, with the hardware cloth going way into the ground 12″, down and outwards. Any digging predator’s efforts will be met with a barrier they can’t get through. And at night, even if they did somehow get into the run, the coop is all locked up with the chickens inside. We’ll also probably have a surveillance system in sometime soon, inside and out. 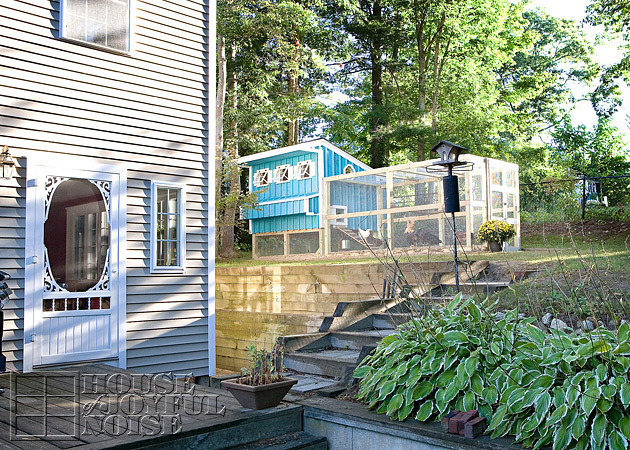 The run is 20 feet long by 6 feet wide, and goes right under the coop, which provides shade and cover for the chickens, in hot weather or precipitation of any kind. As soon as our yard is fenced in a bit better, the chickens will have a few hours a day to free-range as well, while we are also out there to help oversee their protection from any predators. 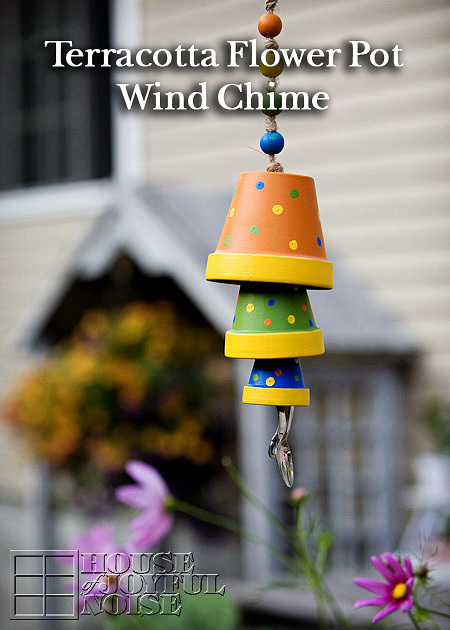 That was decided a few weeks ago when, Alexis was gazing out of the sunroom window watching a cute little birdie at the feeder, when right before her very eyes, a hawk swooped down and grabbed the little guy right off the feeder, and flew away with him. Unsettling sadness! Yeah, that’s not happening to our chickens, if we can help it. The hawks are everywhere around here. As well as some other worrisome predators. So, we’ll be proactive in protecting our flock. 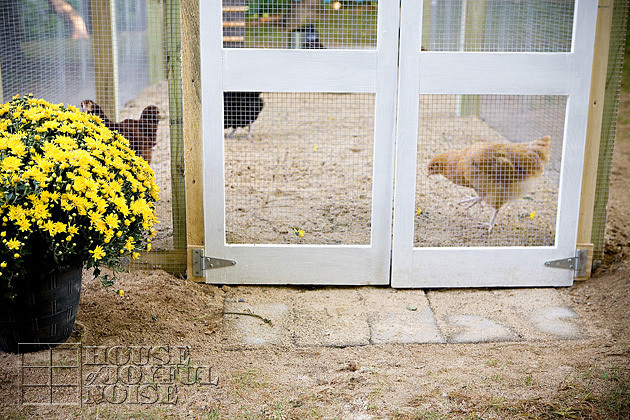 This side of the chicken coop has double doors, that open nice and wide, for easy access. It gives us the ability to get in there and clean out the whole coop, get to any of the chickens if need be, and it also has access to the back of the coop, which is a storage area. So we can grab cleaning tools from the back right from standing at the side here, and yet the storage area is completely closed off from the chickens roosting area when the doors are closed. Photos of a look around the inside are in the gallery at the end of this post. Here is a view of the backside of the coop, where there is another door accessing the storage area. In there we not only keep the cleaning tools, but the chickens feed, extra grit, lime and other stuff we need sometimes. All doors lock with keys, and we do lock it all up at night. And there you have a good look of all sides of the exterior of the coop. The roof is asphalt shingles, and the entire coop is well insulated as well, including the nesting boxes. 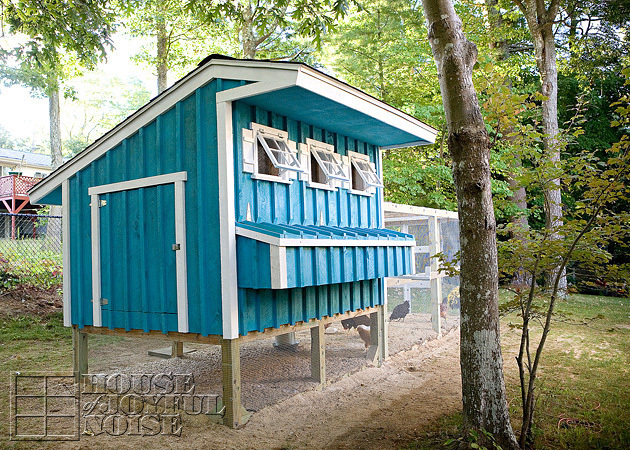 As you will see in the extra photos in the gallery, Michael designed it for fantastic ventilation throughout, as well, which is really important for a stink-freeish coop, and healthy chicken. For those who may be curious, here is photo to show where the coop is located, in conjunction with our house, on our small piece of property. It’s been so very convenient to go right out our back door or from out of the sun room sliders onto our deck, and go right up and out back to the chickens. And……with the very open floor plan of our home, we have a fantastic view of the chickens out of our ample windows, from almost any room in our house. I love that, and it’s exactly why we built the coop and run where and how we did. It’s all more than I ever dreamed, and to be honest, I pretty much gush over it every day. 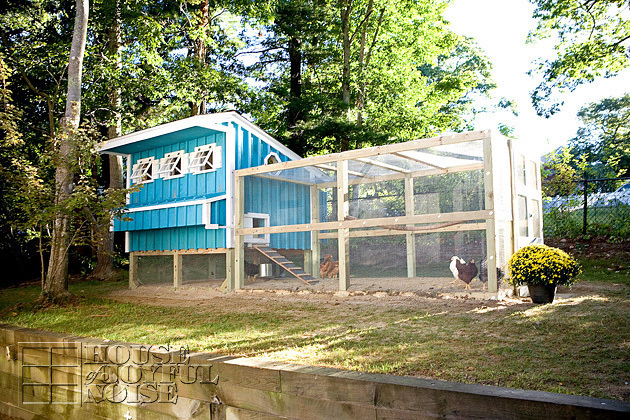 And not because he let me get chickens, and built me the most amazing chicken coop for them. (Although I am quite thankful.). But because he fulfills all of my dreams, about love, and laughter, and family-life lived simply and well, under this umbrella of our unshakeable faith in God. He’s always been super cool to me. And clever, and funny, and thoughtful and handsome. The kids did put in some time, some days, themselves. There is a few photo of them working on parts in the gallery photos. And I did as well. I helped hold things, did a lot of painting and staining, and of course always sharing my input. I have to give it to my little girl Olivia Faith, as well. I don’t know how many days we were working away, and time-to-start-dinner got away from us. She fixed us up several family meals all on her own. A few of the others may have offered to make dinner a night or 2 as well. But Olivia, she’s always right on top of the cooking or baking. But no one can deny, that Michael did the bulk of the work. 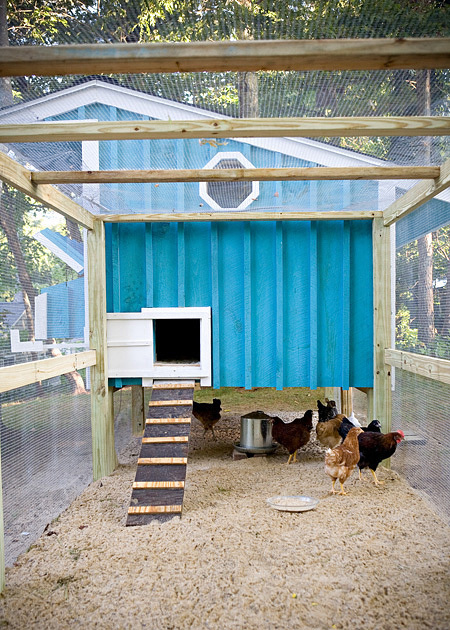 With his full-time job, and all of his side-work too, he worked on this chicken coop every spare minute he had. 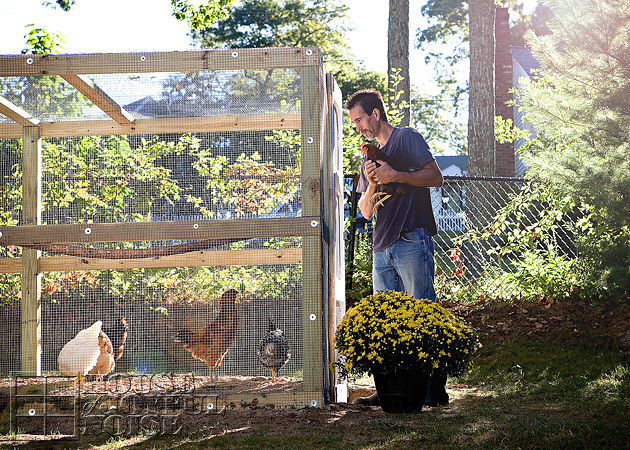 The great thing is, he fell in love with each of these chickens when they were but chirping fuzz-balls in his hand. And he is still downright smitten with them. I am very happy that he gets so much enjoyment out of them, as do all of the kids and myself. That’s what it’s all about! The fresh organic eggs they give us, will just be an awesome bonus! Michael sure does love his big breakfasts! Would you like to see the INSIDE of the coop? Did you miss the process of the coop being built? Care to see some other cool little features of the coop? 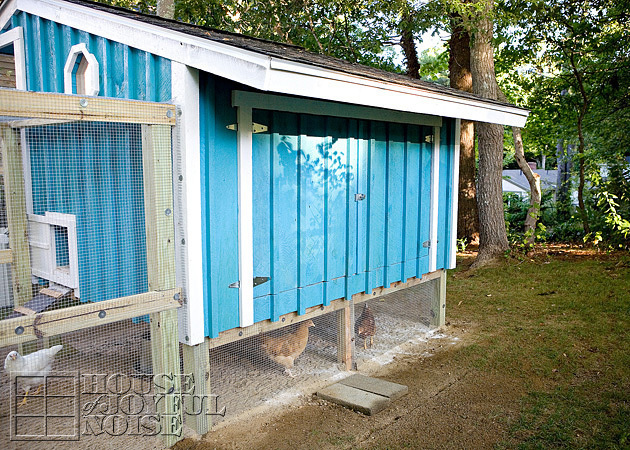 Then just CLICK HERE for More Photos of the Chicken Coop! 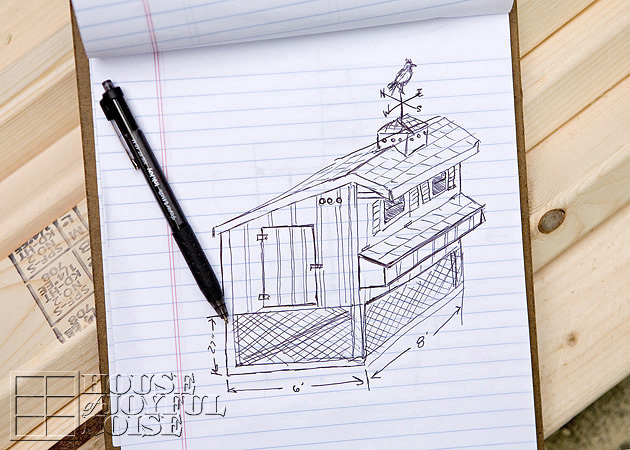 So what’s NOT done yet with this chicken coop project, that we’ll be sharing with you in the near future? Well, we have an awesome old weather-vane that Michael picked up somewhere, and he’ll be building a coupla for the coop, that will not only hold the weather-vane, but even more proper ventilation. And of course, I’ll be adding some cutesy-decor here and there. I plan to make some signage to add, as well as some some other touches. Plus there will always be no shortage of photos of our flock, and all of their daily antics. Thanks for coming to see our coop reveal! Go ahead and leave your thoughts with us, and by all means, please come again soon. Hey Aussiebushgirl! Thanks for your comment! Glad to here you love our coop and color! That is indeed river sand in our chicken coop run. Inside the coop, we use Sweet PDZ. 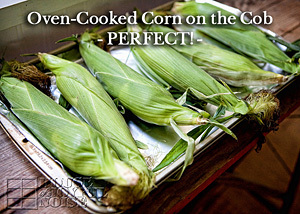 It too is very easy to scoop waste out of, and also neutralizes any odor. We only change it out once a year or so. Sometimes mid year we’ll add some more, to replace any we may have lost collectively, from scooping, even though it does get sifted. You can get a peek at our nesting boxes at the following link from a post when we had our first hatching of chicks! Enjoy! Your coop is absolutely beautiful and well thought out! 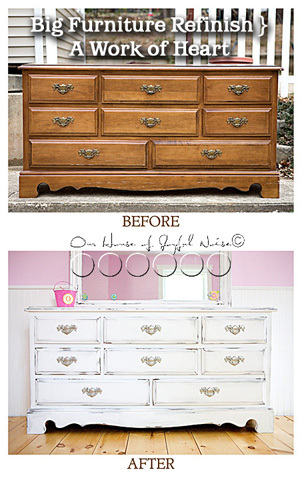 We’re in the process of completing ours and I so wish we would have included storage place as you did. What a great idea! I have a few questions if you don’t mind. What’s on the ground of the run, sand? Pine shavings? Have you completed the cupola yet? That’s one thing I’m planning to do as well but am curious to see your build process. Are those real windows or hand built frames and plexi glass? Love it all! Hey John!! We don’t mind answering any questions you have, at all! We’re happy to! For the run, we got a load of river sand, from our local sand and gravel supplier. 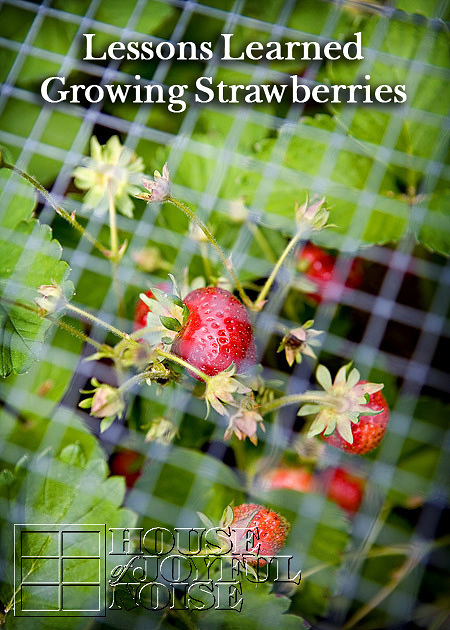 It works out nice because it drains well, and it’s easy to rake out waste. We actually have not done the cupola yet! It’s one of those things where we intended to soon after, and other projects took over and time got away. But thanks for the reminder, so we can get that back on our project list! 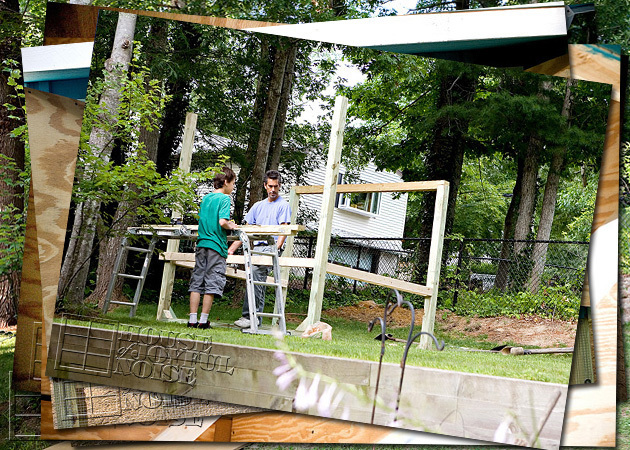 When we do get that project done, we’ll be sure to blog it, on account of your interest in our build process! So be sure to either follow us on Facebook, or subscribe to our blog posts via email, so you don’t miss it! The windows are indeed hand-built frames and plexi glass. The dividers were just glued to the face of the plexi. We hope this helps! If you’ve got any other questions that come up, just leave them right here, and we’ll be sure to help you out as best we can! 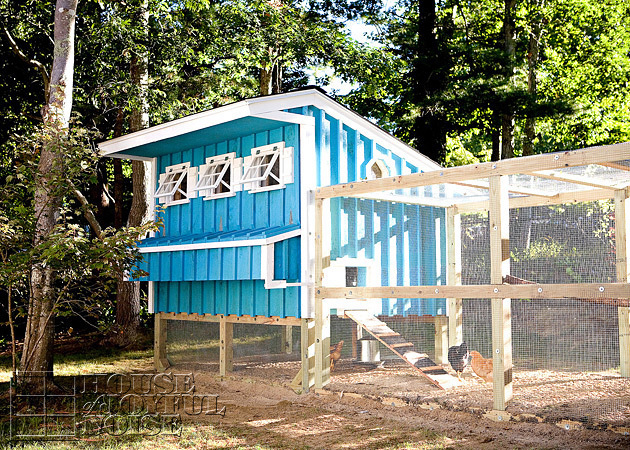 What a beautiful chicken coop! I’m jealous! Thank you so much, Susan! I appreciate the visit, and your kind words. Keeping chickens is great fun, and we are happy to give them a good home. 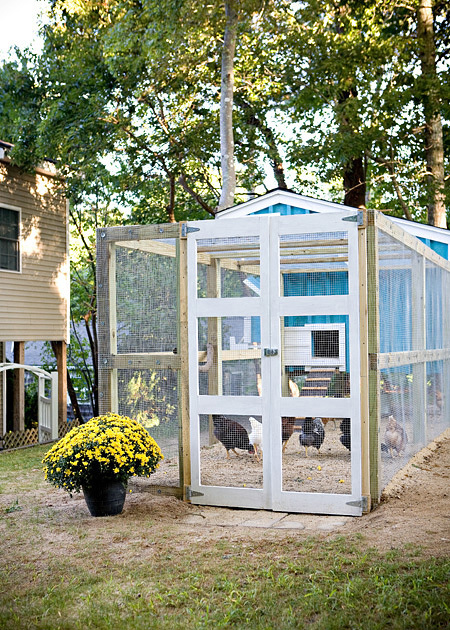 That is one sweet chicken coop – you should sell plans for it! Love the colour and attention to detail – fantastic! Thanks Linda! I thought you might like it. 🙂 The chickens really do as well. Everyone says he should sell plans for it. The thing is, he never really had any real plans to go by. He just did a sketch of how he wanted it to look, and kind of figured it out as he went along. That’s how he works. Thanks for coming over and checking it out! Wow wow wow !!!!!! Michael you really did work hard amd it is beyond awesome !!! You are so talented ! I am in awe no exaggeration. Very nice. Do you still have the deck? Thanks, Kim! Yes, we still have our deck.